A very beautiful work by A. Palladio who did not see it completed; it has much in common with the Church of the Redentore. The interior in the form of a Latin cross with a nave and two aisles contains works by masters such as J. Tintoretto, J. Palma il Giovane, and V. Carpaccio. The Presbytery is of particular interest, containing two masterpieces by J. Tintoretto: The Last Supper and Manna from Heaven. In substantial continuity with the design of the Refectory, only a few years later Palladio would undertake the construction of the convent’s great church, indubitably his most complex and difficult project since the construction of the loggias of the Basilica in Vicenza. The great wealth of the monastery and of the powerful Congregazione di Santa Giustina dictated the scale of the enterprise; the precise liturgical requirements and traditions of the order determined the choice of a longitudinal plan, as well as the presence of the choir, presbytery, crossing, nave and dome. 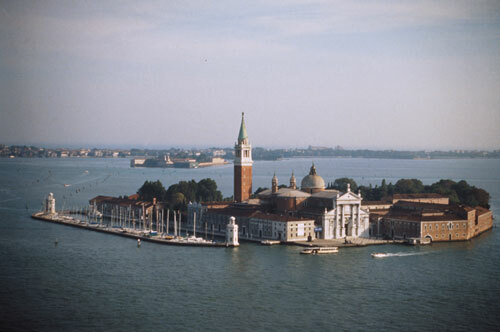 Between November 1565 and March 1566, Palladio’s project was worked up into the model which impressed Giorgio Vasari so profoundly on his visit to Venice. In January of the following year, the contracts with the masons and builders were drawn up, stipulating that they must follow the moulding profiles and measurements indicated by Palladio. In 1576 the overall structure was capped out. Many years later, between 1607 and 1611, the present façade was actually built and recent studies have shown that it is far removed from Palladio’s original wishes. Like Leon Battista Alberti a century before him, Palladio took the great baths of ancient Rome as his model. In plan, one can clearly discern the four spatial entities devised by Palladio to make up the body of the building. Following on the barrel-vaulted nave against which are set three cross vaults — a true and proper frigidarium from the Roman baths — comes the unexpected lateral expansion of the apses and the vertical of the great drum and dome. Next to the latter Palladio set the extremely studied space of the presbytery, through whose screen of columns is visible the choir, constituting an inside-outside space, almost as if the columnar screen were the pronaos of a villa through which one glimpsed the countryside. The sequence of spaces runs along a very emphatic central axis which guarantees continuity and the passage from one zone of the church to another. In the details of the order Palladio sought the greatest variety, refusing facile and predictable solutions, and he set great emphasis on the plastic force of the architectural membering: the engaged columns billow out beyond their diameters, the pilasters jut out greatly, and vertical continuity is continually sought throughout the elements of the order. The outcome is a building of grandeur, which resurrects the spatial emotions of ancient Roman achievements. From April to October from 09am to7pm from November to March 08:30am to 6pm. The last visit to the bell tower is 20 minutes before closing. Sunday visits are suspended from 10:40am to 12:00 during the holy mass.